Follow this new polymer clay tutorial to learn how to make beautiful polymer clay brooches in many different colors to match any of your outfits. For your convenience, I included in this tutorial instructions for mixing up a few custom colors. Most of these colors are from the Pantone Spring 2015 collection: Marsala, Sandstone, Woodbine, Tangerine, Strawberry Ice, and Aquamarine. With an addition of a couple simple jewelry findings each of these brooches can be transferred into a necklace or decorated with chains and beads as shown in the example pages from the tutorial (below). Additional tips and notes to help you successfully complete this project. 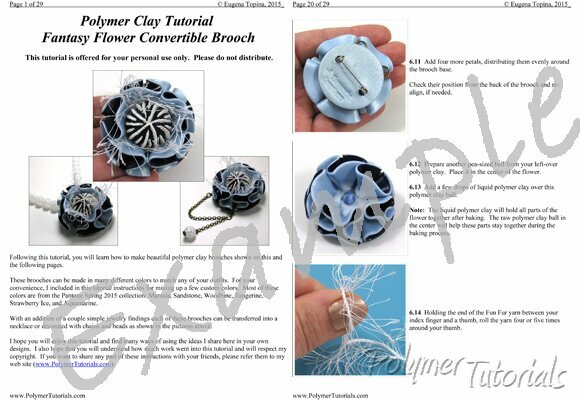 All brooches shown on this page are demonstrated in the tutorial. Place a mouse over the small pictures to see them enlarged.